Any Monday where I wake up at 8 instead of 5 a.m. is a Happy Monday to me! Sending out my sympathy to all my blog friends who are still at work this week. I'm going to take a break from Mouth Off Monday until the new year (because I'm on vacation and who has anything to mouth off about while on vacation?) 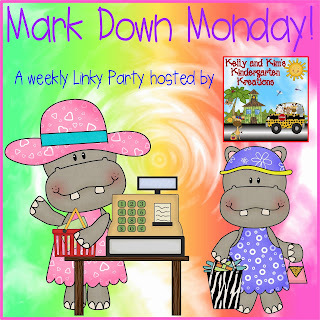 and instead link up with Kelly and Kim's Kindergarten Kreations for Markdown Monday! Taking a cue from our hosts, I'm going to markdown my whole store. That's right, It Happened in Third is having a sale this week...grab my products for 20% off! With this product, you can whip up differentiated menus for the range of learners in your class in a flash. Also includes a reflection sheet! Also, don't forget to check out my Spelling Choice Board! If you're looking to revamp your spelling homework or centers after the New Year, look no further! With 27 different activities, your students will never get bored! With it being the end of the year, I also wanted to reflect a bit on my TpT journey so far. I set up shop in mid-July, and so far the experience has been overwhelmingly positive! I am glad that after years of talking about it, I finally took the plunge. When I started, I set a few modest goals for myself. I'm proud to say that so far, I am either meeting or on track to meet most of them! Even in areas I fell short on, I'm not too far off. With all that I've dealt with in this same time period, I'm going to count that as success! I have some great ideas for It Happened in 3rd for 2016, so make sure to keep checking back! Don't forget to stop by Kelly and Kim's Markdown Monday and check out all the great deals!